I always make a habit to read some authors' books. One of those authors is Sarah Jio. 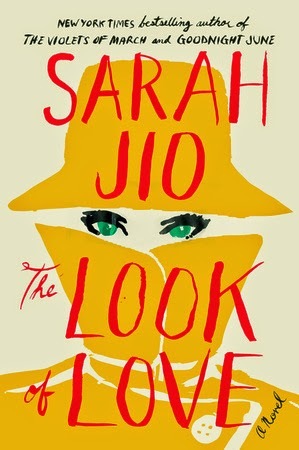 Her novels usually deal with women and their relationships including friendship and romance, and her latest novel THE LOOK OF LOVE is no different. This book actually is all about love. THE LOOK OF LOVE tells the story of Jane Williams, a florist who has the ability to see true love. She didn't have the best upbringing or even the best of luck of romance, but she's managed to create a successful floral shop in Seattle. On her 29th birthday, she receives a mysterious message from a total stranger telling her that she must identify the six different types of love before her next birthday. If she successfully completes this, she will find true love. If not, well... it's not looking good for Jane -- she will be alone forever! Jane spends the next few months trying to identify the six types of love while also managing her relationship with a science writer who doesn't believe in love. Naturally, some forms of love are easier for her to identify than others; however, Jane begins to see love everywhere. The question for Jane is, can she find true love herself before time runs out? I enjoyed THE LOOK OF LOVE quite a bit and I think it was exactly what I was needed when I read it. Jane is a likable character and the story moves quickly. There is even some magic realism thrown in between Jane's "ability" and the links between the present and the past. Overall, it was a fun read that celebrated all types of love. And who doesn't need a little love in their life? While I really liked THE LOOK OF LOVE, I don't have a lot to say about it in this review. That certainly doesn't take anything away from this book, and it truly did give me a lot to think about. Rather, I think it's a story that's best left to each reader to interpret. It is both fun and entertaining, and I especially appreciated the various relationships that Ms. Jio used to represent the six types of love. One interesting thing about THE LOOK OF LOVE is that this novel had a little of the unexpected in it. First of all, I was surprised by her use of magic realism. I actually thought it worked with in this story, and that's saying something because I'm not the biggest fan of this literary trick. In addition, I really appreciated that this novel explored not only love, but the ups and downs of love. It easily could have been a sugary sweet story and I don't think I would have appreciated it as much. Instead, I liked that it showed love in all forms -- for richer for poorer, in sickness and in health, etc. -- you get my drift. Like all of Ms. Jio's novels, THE LOOK OF LOVE would be a fun book to discuss. There is a reading guide available with fifteen questions as well as an interesting interview with the author. Some of the themes you might want to delve into include the various types of love. There are numerous relationships in this novel that could be explored as well as Jane's reaction to her gift. THE LOOK OF LOVE was a fun book that celebrates all things love! I think it's an ideal read as Valentine's Day approaches. I read The Look of Love a couple of months ago. Once I got the characters figured out, I really enjoyed it. This sounds like something different for Jio. I can't wait to try it. I still haven't gotten to this one, but usually really like Jio books.